Why is it that although socks are sold in a pair, they long to be singles? Why do some socks seem to have an apparent natural urge to separate from their sock partner as soon as possible? Why is their partnership with another sock so anathema to them that they must find the first feasible way to enter sock singledom? Some use the washing machine as the perfect venue, others the back of the couch, more adventurous socks have even been found at the bottom of the freezer! Some let the cat or dog take them away, some sneakily climb into the garbage can rather than stay another moment with their designated sock partner. What can we do about this? 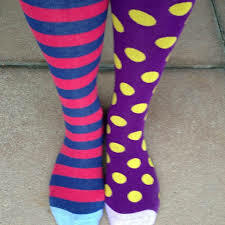 Should socks have free choice in selecting their partner? How can we impose on them our own ideas of what a perfect sock partnership should look like? Should we buy our socks in singles, and gently introduce them to another sock? Perhaps they are the kind of sock that is attracted to an opposite? Do we mix stripes with plain, work socks with sport socks, cotton with spandex? An example of Free Choice Partnerships in Socks! Show your support for Free Choice Partnerships in Socks, by not wearing an pre-paired “Perfect Pair” tomorrow (if you dare)! If you have a sock story, or a theory of socks and partnerships, please let me know. Great question to an age old dilemma!! 🙂 It is very worrying. I’m wondering if ne day there will be a sock uprising!